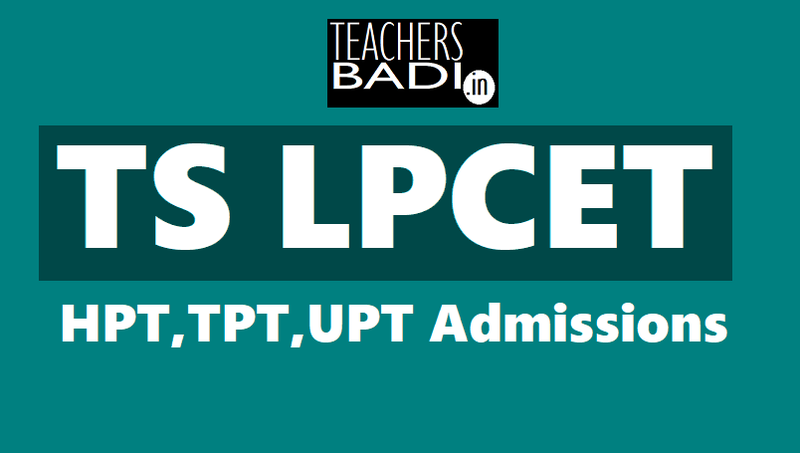 TS LPCET 2019 Qualified Candidates Meirt List Results: TS LPCET 2019 Hall tickets, Results for HPT, TPT, UPT course Admissions: TS LPCET 2019, TSLPCET 2019, TS Language Pandits Training COurse Entrance Test 2019, TS LPCET 2019 for HPT, TPT, UPT course Admissions (Language Pandits Training Course). Telangana #TSLPCET 2019 Notification will be issued by the DSE Telangana for admission into One year Language Pandit Training Course(LPT) in Govt. IASE /CTE and Private LPT Colleges in Telangana State. Telangana State Government, School Education (Training) Department has given the GO. MS.No.31 on Dated:17/10/2018 for adaptation of the Andhra Pradesh conduct of Language Pandit Common Entrance Test for Admission into Pandit Training Course Rules, 2006 to the State of Telangana. Now, this order may be called the Telangana State Conduct of Language Pandit Common Entrance Test for admission into Pandit Training Course Rules. TS LPCET 2019 Exam will be conducted on ...05.2019. LPCET Telugu Pandit Merit List, LPCET Urdu Pandit Merit List, LPCET Hindi Pandit Merit List. LPCET Merit List Results are placed on its web portal, LPCET Candidates may download your meirt list. The Commissioner and Director of School Education (CDSE) have announced the results of the Telangana State Language Pundits Common Entrance Test 2019 (TS LPCET 2019) for which examinations were held on May 16, this year. The examinations include, Telugu Pundit Tests (TPT), Urdu Pundit Test (UPT) and Hindi Pundit Test (HPT). According to a CDSE press release, Gopaladasu Madhu has scored 87.6 per cent, which is highest out of 1,743 qualified in the examination of TPT. Durdana Begum and Upparapally Narender has scored 68.5 per cent and 62.7 per cent in UPT and HPT, respectively. The qualifying marks in LPCET far ranking for OC and BC candidates shall be 35 per cent of the aggregate marks. Step 4: Then, TS LPCET Results page will be opened. Step 5: In this page, enter your "TS LPCET Hall ticket number"
Telangana’s LPCET likely to go online: The Language Pandit Common Entrance Test (TS LPCET) is likely to be held online from this year. A notification to this effect will be released by the State government soon. The examination is being held after three years and for the first time since the formation of Telangana. With an aim to improve quality, the State government had asked the National Council for Teacher Education (NCTE) to increase the nine-month pandit training course to two years. The conduct of examination was delayed as the NCTE was yet to frame the guidelines, an official said. Recently, the Hyderabad High Court directed the State government to conduct LPCET within six weeks. There are over 3,600 seats in Telugu, Hindi and Urdu languages in about 40 Language Pandit Training Institutions across the State. Meanwhile, the Directorate of School Education has invited applications from the Pandit Training Colleges for grant of affiliations for the academic year 2019-2020. The colleges seeking affiliation have to pay requisite fee of Rs 75,000 and last date to apply to Director, State Council of Educational Research and Training, is on or before April .. So, DSE Telangana will invite the online applications from the eligible candidates through its official website http://lpcet.cdse.telangana.gov.in as per schedule for admission into LPT Courses in TS state for the academic year 2019-2020. LPCET 2019 will be conducted in the month of March 2019 in all Districts. The fee prescribed for appearing for LPCET is Rs.400/-. Candidates can pay fee through TSONLINE or Payment Gateway service. The candidates who have passed the above examination as on the date of submission of application are eligible to appear for LPCET-2019. Detailed procedure for applying ONLINE is given in the Information Bulletin. Candidates can download the ‘Information Bulletin’ free of cost from the LPCET website: http://lpcet.cdse.telangana.gov.in in this month. Candidates can submit their applications through online mode only. TS LPCET 2019 Exam will be conduct on ..05.2019. Tslpcet website open avatam ledhu endhukani sir.... Please reply.